Rosero, D., Alvarez, R., Gambó, P., Alastuey, M., Valero, A., Torrecilla, N., Roche, A., Simón, S. (2016). Acinic Cell Carcinoma of the Parotid Gland with Four Morphological Features. Iranian Journal of Pathology, 11(2), 181-185. David Rosero; Ramiro Alvarez; Paula Gambó; María Alastuey; Alberto Valero; Nerea Torrecilla; A. Belén Roche; Sara Simón. "Acinic Cell Carcinoma of the Parotid Gland with Four Morphological Features". 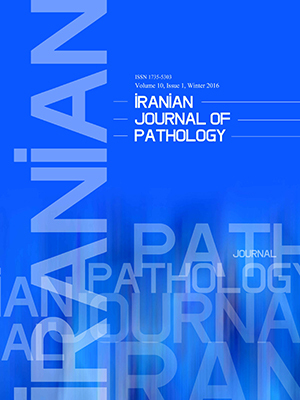 Iranian Journal of Pathology, 11, 2, 2016, 181-185. Rosero, D., Alvarez, R., Gambó, P., Alastuey, M., Valero, A., Torrecilla, N., Roche, A., Simón, S. (2016). 'Acinic Cell Carcinoma of the Parotid Gland with Four Morphological Features', Iranian Journal of Pathology, 11(2), pp. 181-185. Rosero, D., Alvarez, R., Gambó, P., Alastuey, M., Valero, A., Torrecilla, N., Roche, A., Simón, S. Acinic Cell Carcinoma of the Parotid Gland with Four Morphological Features. Iranian Journal of Pathology, 2016; 11(2): 181-185. Acinic cell carcinoma arising in salivary glands is a rare tumor, accounting for 2% to 5% of the primary neoplasms of the parotid gland. When these tumors are well-differentiated, the neoplasia has innocuous aspect, due to the similarity to normal parotid tissue. This makes the diagnosis difficult. Initially the malignancy of this tumor was uncertain; however, recent studies have declared it as malignant. The female / male ratio is 3:2. The nodule usually presents as solitary and well defined shape. Several authors have used different terms to describe histomorphological patterns of these tumors. Four descriptive categories (solid, microcystic, papillary-cystic and follicular) are useful for pathologists. Here we report a case of a 49 yr old man with a left parotid nodule of 5 cm. Parotidectomy was performed at the Hospital Universitario Miguel Servet, in Zaragoza (Spain). The microscopy showed a tumor with acinic semblance, having the four morphologic patterns previously described. The morphological and immunohistochemical study was consistent with the diagnosis of acinic cell carcinoma. Franco C, Torres J, Rodríguez P, González I, Volpato R. Carcinoma de células acinares: gradación histológica. Rev Chilena de Cirugía 2003. 55(2):132-5. Boukheris H, Curtis RE, Land CE, Dores GM. Incidence of carcinoma of the major salivary glands according to the World Health Organization (WHO) Classification, 1992-2006: a population-based study in the United States. Cancer Epidemiol Biomarkers Prev 2009;18(11):2899-906. Uro-Coste E. WHO classification of salivary gland tumors: Instructions. Ann Pathol 2011;31(5):S95-6. Hoffman HT, Karnell LH, Robinson RA, Pinkston JA, Menck HR. National cancer data base report on cancer of the head and neck: acinic cell carcinoma. J Oral Maxillofac Surg 1998; 56:440-3. Zermani R, Rammeh S, Farah F, Kourda N, Zeddini AF, Bettaieb E, et al. L’adénocarcinome à cellules acineuses de la parotide de l’enfant (À propos d’une observation). Ann Pathol 2004. Doi: AP-11-2004-HS1-0242-6498-101019-ART155. Munteanu MC, Mărgăritescu CL, Cionca L, NiţulescuNC, Dăguci L, Ciucă EM. Acinic cell carcinoma of the salivary glands: a retrospective clinicopathologic study of 12 cases. Rom J Morphol Embryol 2012;53(2):313-20. Schwarz S, Zenk J, Müller M, Etl T, Wünsch PH, Hartmann A, et al. The many faces of acinic cell carcinomas of the salivary gland: a study of 40 cases relating histological and immunohistological subtypes to clinical parameters and prognosis. Histopathology 2012;61:395-408. Batsakis J, Luna M, El-Naggar A: Histopathologic grading of salivary gland neoplasms: II acinic cell carcinomas. Ann Otol Rhinol Laryngol 1990; 99: 929-33. Gete García P, Almodóvar Álvarez C, García Álvarez G, Rodríguez Francos MI, Cerván Rubiales F, Sangó Lamban P. Parotid tumours: correlation between fine needle aspiration biopsy and histological findings. Acta Otorrinolaringol Esp 2006;57:279-82. Godwin JT, Foote FW, Frazell EL. Acinic cell adenocarcinoma of the parotid gland: report of twenty-seven cases. Am J Pathol 1954;30:465-77. Daneshbod Y, Daneshbod K, Khademi B. Diagnostic difficulties in the interpretation of fine needle aspirate samples in salivary lesions: diagnostic pitfalls revisited. Acta Cytol 2009 Jan-Feb;53(1):53-70. Nagel H, Laskawi R, Büter JJ, Schröder M, Chilla R, Droese M. Cytologic diagnosis of acinic-cell carcinoma of salivary glands. Diagn Cytopathol 1997;16(5):402-12. Pinto A, Nosé V, Rojas C, Fan YS, Gomez-Fernandez C. Searching for mammary analog secretory carcinoma of salivary gland among its mimics. Mod Pathol 2014;27:30-7.